Donkey Kong is up to his old tricks again, and there's only one solution; Mario. The world's favorite plumber is back, and must once again rescue Pauline. This is the fourth game in the series, and the third on the DS. The game is set in a theme park style world, with different themes running throughout each level. 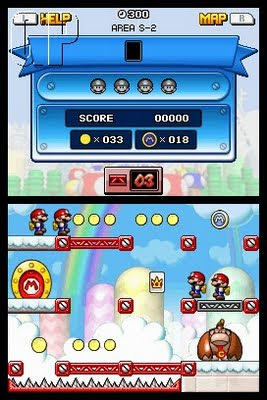 Not that you will have time to appreciate it, with all of your concentration being on the mechanical Mini Marios. See, the twist with this game is that you have no direct control over the characters on screen. They just march on forward. If they hit a wall they'll turn around and carry on marching. If they come to a ladder, they will ascend of descend it, depending on where it is. So this is where you come in. Using the stylus, you create, move and eliminate aspects of the level, which can be used elsewhere if need be. To start with, you just have control over steel girders. They can be used as walkways or as walls, and mastering them is pretty easy. 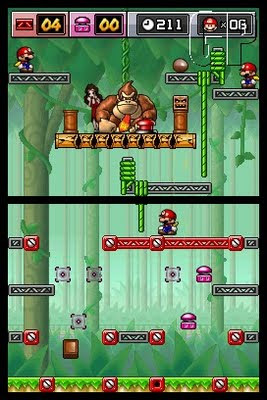 Soon enough though, you can be in charge of many elements on a single level, such as ladders, conveyor belts, springs and the classic Mario mode of transport, the warp pipe. You will need careful planning, quick fingers and nerves of steel to master some of the later levels, especially if you want to collect the coins and cards, and get the high score trophy. You could completely ignore the collectables and trophies, but they make the game much more complex and definitely extend the lifespan by a lot. So once you have collected everything and killed any creatures, you must forge a path to the exit door. Be careful though, because as soon as the first Mini Mario exits through the door, a timer starts. If the timer hits zero, the door seals, banishing any remaining Minis. You must have all of them heading in the right direction with as little space between them as you can get. There are some levels which play with the formula a bit, and include other characters. Well, mini, mechanical versions of other characters, such as Peach and Toad. You must get them to their specific doors, and whilst it doesn't sound much different, it adds a new challenge to the game as you have to make multiple paths to the different doors. The mini game levels are much simpler in theory, but can get quite difficult. A number of pipes hang from the top screen, and there are boxes at the bottom. You must get the characters that drop either to their character box, or to a score multiplier box, depending on the level you choose. The characters drop quite quickly and it's easy to mislead some of them in the frenzy. They're both great for mixing up the pace a little and keeping the game interesting. The game simply wouldn't work on any other system, as only the DS gives you instant control and the ease to select different areas on the map without using awkward analogue sticks. It's a great puzzle title with an insane amount of unlockable content (another incentive to perfect levels), a lengthy story mode and even a level editor. Once again Nintendo create a game perfect for their console and made with their fans in mind.